Having satisfied myself that I can’t separate my work from my politics, I have a somewhat indulgent post about the current events of the day. I’ve been following the Labour Leadership contest with intermittent interest. Since the election the interregnum between Gordon Brown’s resignation and the assumption to the role of leader by Ed Miliband has given the coalition time to ride out their ‘honeymoon’ period. At the time, I thought it might have been better (although I don’t think the Labour Party constitution would allow it) for another leader to be crowned as soon as possible. In retrospect, I can see the benefit of having had the hustings and debate about the leadership and more importantly, the time for the Coalition to ride out the initial positive freshness and have a strong leader in place for the upcoming spending review and into the future. I am no wise political pundit – I was always expecting a Miliband victory – just not necessary that particular Miliband..There was the curious factor in having two brothers fight the election against each other and in a competition between two Eds and two Milibands, I suppose it satisfies a certain neatness to have the candidate who is both an Ed and a Miliband win. Away from the flippancy, I expect an intellectual rigour and broad understanding of policy. The noises made seem to be fairly positive and, as the election proved, the electorate needed change and if I had had a vote, I would have voted for him. I don’t really need to explain my views about Balls – I have elsewhere and I won’t ever be able to shake off my distaste for him. I find him below contempt. I respect Diane Abbott as a politician and have for a long time. She is a welcome face of diversity among the candidates – not just as a black woman but because of her background politically. She is a strong conviction politician. I hope she has a place in the future of Labour and that her voice remains strong although I don’t really have much doubt that it will – it’s just a matter of how closely she is held to the centre of the power axis. Burnham was a bit bland in my view and I didn’t really know where to place him but I’m not a long-standing Labour activist. My only ‘contact’ with him was a Secretary of State for Health and to be honest, he didn’t have time to make a deep mark. I have no doubt he’ll pop up again. So back to the Milibands. David, possibly lost out by being more closely associated with the previous government and the backing of Blair possibly didn’t help him in the wake of the publication of Blair’s memoirs but ultimately, the race was just so close that any number of things could have affected the result one way or the other. Ed placed himself to the left of David. He spoke more about grassroots and not losing sight of the Labour movement from which the party grew. David, as the more senior politician was more closely linked to the previous government and her policies – some of which, especially the military action in Iraq and Afghanistan and deeply unpopular. Ed is a little less tainted by association. The whispers have already started about the place the union and affiliate membership had in the electoral college system that Labour uses to elect a leader. I expect they will continue for a long time. As a union member, I don’t see why the positions of the unions shouldn’t have value. Although there’s a massive difference between union member and union activist (which I’m not really – although I’m beginning to feel maybe I should be.. ). Lots of the target centre voters are union members as well – they aren’t the sole domain of the blue collar classes. I have a feeling unions may become ever more important over the next few years as well as the cuts bite and it’s worth remembering that union members are people with votes too and shouldn’t necessarily be discounted so readily by the press. From here, I wish all the candidates well, especially the new leader of the Labour Party. Personally, I hope he’s able to restore some of my faith in the Labour Party. On a more fraternal note, I wonder if it’s the first time that the winning leadership candidate told his closest rival that he loved him on stage. The long weekend is over but it doesn’t quite feel like a ‘back to work’ sensation yet. A pleasant weekend was had but the weather wasn’t terribly clement – no matter – a few days off work can never be a bad thing..
And we have the news that an election is going to be called this morning. Gordon Brown will meet with the Queen this morning and ask her to dissolve Parliament. To say it was expected is an understatement but I’ve always rather enjoyed the build ups to the General Elections. I missed one when I was living overseas but generally, I like to take an interest. I’m rather glad we have a set four week period for electioneering though – sometimes it seems to drag a lot in the United States where there are fixed terms. The alternatives all seem a little drab at the present. I’m pretty sure I know which way I will vote. I’m also pretty sure it won’t make a blind bit of difference in the constituency in which I live – which is a very safe seat. I am, as always, determined to vote even though the vote might seem to be ‘wasted’ as at least it will figure in national statistics and the like – and with London local elections on the same day (although I suspect they are fairly safe in my ward as well) there is more possibility of a move on that basis. For me, it seems that the certainty of a Labour defeat is far shakier than it was. I can’t help but feel bitter towards the government (Ed Balls, I’m talking to you!) and their abandonment of what I would have termed Labour principles. Working from inside the public sector, in an agency which has been a political football – I wonder if some of the damage that has been done will ever be able to be undone. Hard decisions haven’t been made when they should and could have and there has been too much pandering to the mob mentality. Targets, targets and more targets have been crippling at work. 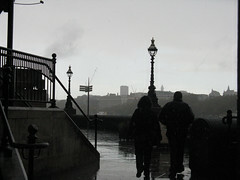 And there are very real effects on the day to day life of people who should be served and protected by public services. For all of Labour’s disappointments, I find it much harder to stomach the Conservatives at the moment. Not least because they have presented themselves as a train wreck party without a clue about how to actually appeal sensible policies (obviously this is my opinion – many people would view their policies as sensible) but also because they did far more damage in their last incumbency although that was so long ago now… I will watch them with interest though – see if there is any room for surprises although I’m more than a little sceptical. That leaves the Liberal Democrats (I have voted Green in the past but never in a General Election, I have no time for UKIP whatsoever). They certainly feel the most akin to some of my own thoughts and ideas naturally but it’s easier to make these statements if one is the smaller ‘third’ party without a chance of governing. I have to say I haven’t followed them too closely but that’s something I can remedy. As I have done at each election (save one) since my eighteenth birthday (I was very much more interested in politics with a large ‘P’ in my youth!) I’ll secure myself a manifesto of the three largest parties and try and provide some of my thoughts as the week goes on – particularly in relation to social care and social policy – but also covering other areas of interest. Although looking at an election through the glasses as someone who works in a sector that is completely dependent on ever-changing boundaries and government initiatives and reliant on generally held paradigms of social policy, it will make for interesting comment nonetheless. This will be campaigning about cuts and money-saving. Reducing deficits and chopping down the ‘public sector’, but I wonder if there will be any room for hope and expectancy among the policies mooted – any room for creativity and difference. I approach this election less sure than I have been for a long while as to whom I will vote for. I also have more questions about policies and particulars than I might have had previously – the Labour Party has a lot of explaining to do about the last five years in particular – in my view and I want to be convinced and feel like a vote is a positive choice rather than an elimination of the negatives. And so the starting whistle is blown. Let’s see where it takes us.. Living in London, as I do, we only have the European elections today while parts of the rest of the country contend with local elections as well. I have never missed casting a vote in any election for which I have been eligible to vote and I don’t intend to today. If I’d been a little more organised, I’d have registered a postal vote as the polling station is a little bit awkward to get to but nothing I can’t live with. 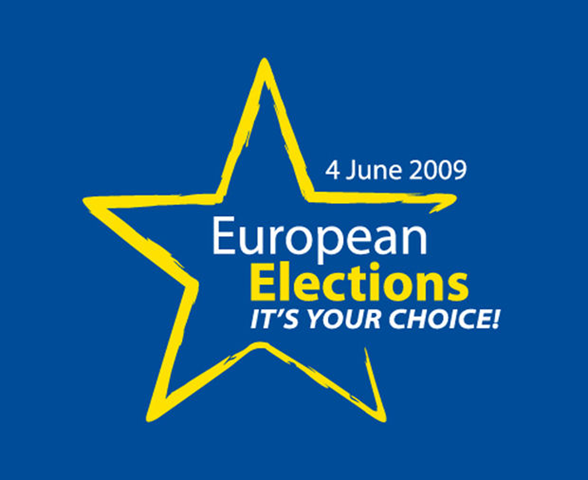 The European elections are often seen as a good route to protest and yes, I’ve voted for the Green Party before in a desperate attempt to find an A.N.Other option. Truth is, the disillusionment with politics has cut deep over the past few months. It was probably fairly impressive anyway, but with the details of MPs claiming expenses for memorial wreaths at Remembrance Day events (which personally, I find more despicable than claiming for a duck island) and for ‘servants’ quarters’ there is a lack of faith in the political class. There is a generalised fear that the far right BNP will garner some of the votes of those who are disillusioned and really, that is my key motivator to vote – possibly because the system of voting by lists and parties is somewhat different for these elections. So I’ll go to vote not least because there is more likelihood that the turnout will be low and therefore the votes cast will have more ‘strength’ and to register an opposite view to those based on the hard and dangerous right. Like the rest of the country, I’m expecting a massive ‘no confidence’ vote in the government and possibly in all of the main stream political parties. As for my own first choice vote, I’m still undecided. I’m a generally a liberal minded pro-European. I can never vote Conservative and have no inclination whatsoever to vote Labour. It usually deposits me at the door of the Liberal Democrats – who tend to appeal to my warm and fuzzy ‘social justice’ nature and probably will again today although I may be tempted by the Green Party again. 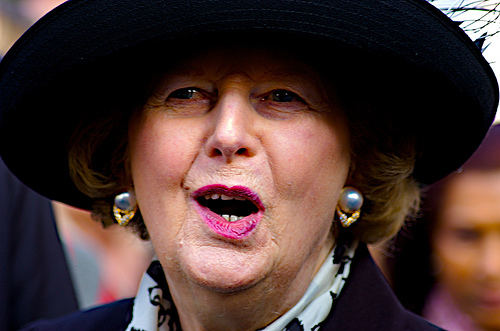 I grew up in a household in which Thatcher was something of a dirty word. We were living in Yorkshire in a period of my childhood that coincided with The Miners Strike (83/84). As my father collected us from school, we had to drive through police checks and with his London accent he was often identified as a possible ‘flying picket’ even with three schoolgirls in the car with him. I remember returning south and trying to defend in my rather unsophisticated childish ways why the mines couldn’t close and how important they were to the people whose livelihood depended on them. I remember the excitement I felt, after the poll tax riots and the ‘stalking horse’ election that anyone other than Thatcher could be a Prime Minister. I grew up with her and was of a generation described as Thatcher’s children. I don’t know if it is age that has changed my views or just a greater understanding of the nature of politics and politicians. The revelation (confirmation really in the face of many rumours) that she has dementia made me sad all the same. Best wishes to her and her family.